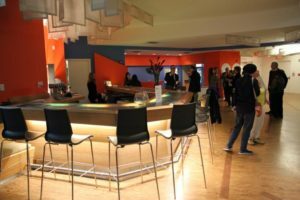 Artisphere Closing Anniversary — It has been three years since Artisphere closed its doors in Rosslyn. 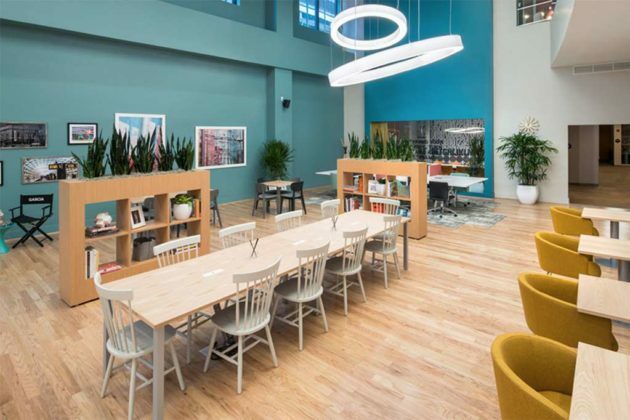 The former county-funded arts venue is now a co-working and events space. 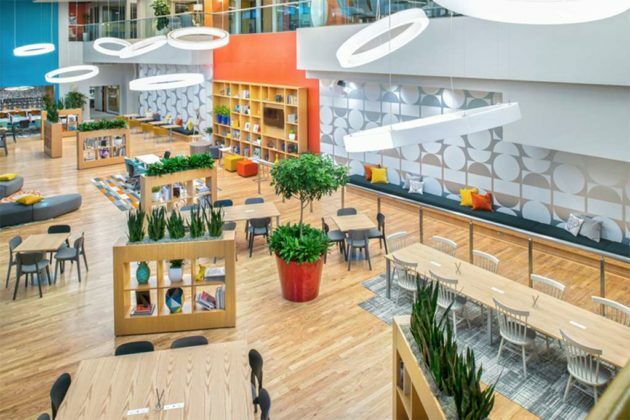 The former Artisphere space in Rosslyn has a new lease on life, as co-working area Spaces opened earlier this week. Spaces is located at 1101 Wilson Blvd, in a building owned by Monday Properties. 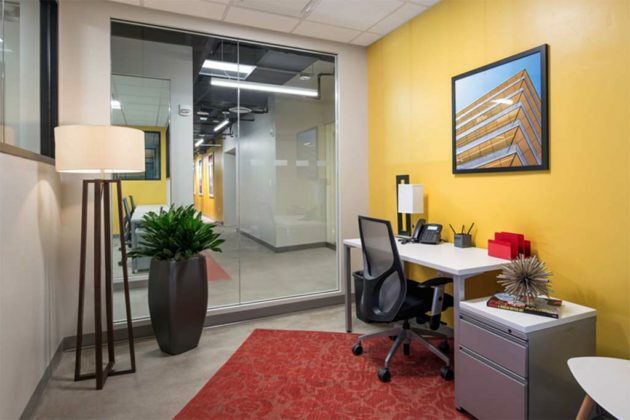 The chain’s Rosslyn location offers 303 desks in a 37,000-square-foot office space. Members can use any workstation, or can pay more to reserve one. Suites are also available for small businesses. Up to 800 members can be accommodated. 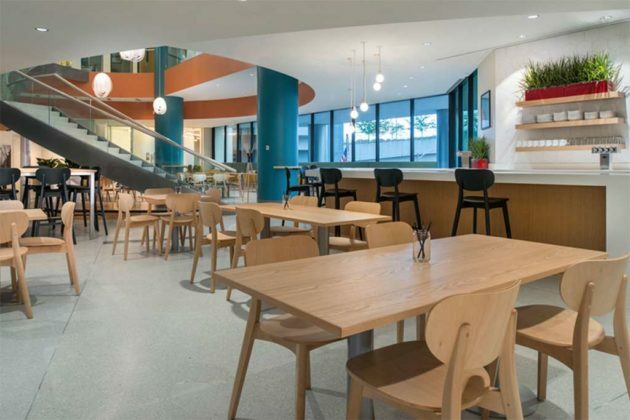 A large open area with a full kitchen, bar/café and eight beer taps can be reserved for meetings and parties, and doubles as a co-working space when not in use for events. 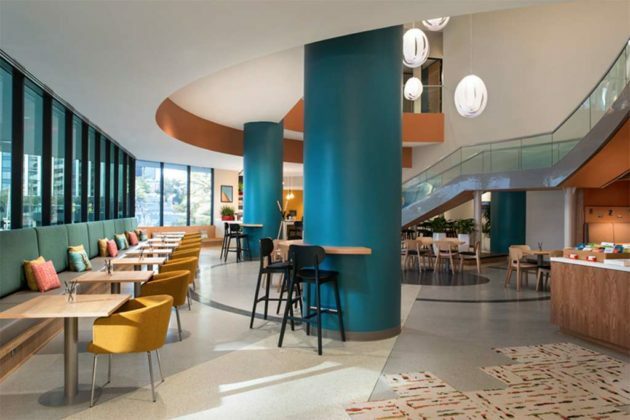 Members can also access 9,000 square feet of outdoor space, including a large balcony, while its upper atrium connects to Rosslyn’s Freedom Park. 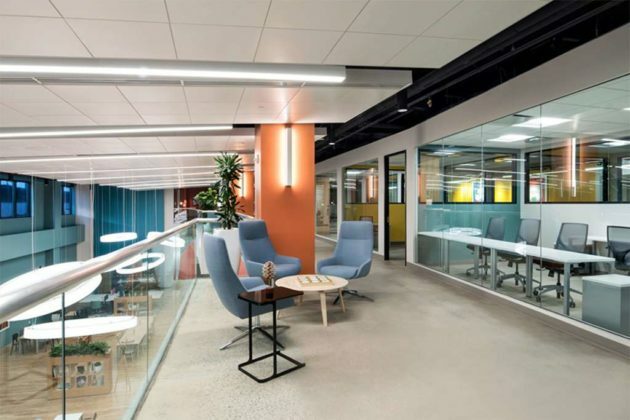 At a ribbon-cutting ceremony on Monday, Rosslyn Business Improvement District president and CEO Mary-Claire Burick said the new co-working space, one of several open or planning to open in Arlington, will foster community. Photos via Mary Parker Architectural Photography, courtesy of Monday Properties. Disclosure: Monday Properties is an ARLnow advertiser. 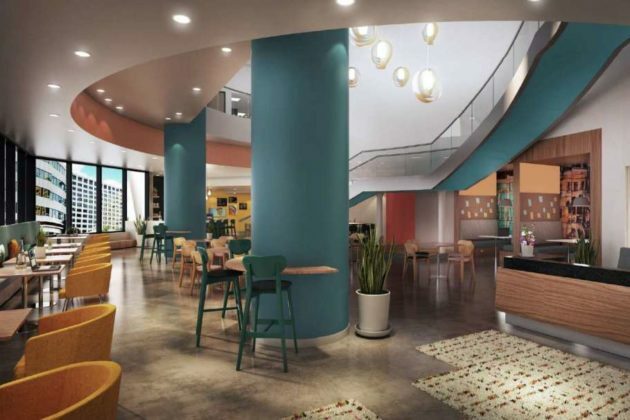 A large new coworking space will breathe new life into the former Artisphere in Rosslyn this fall. 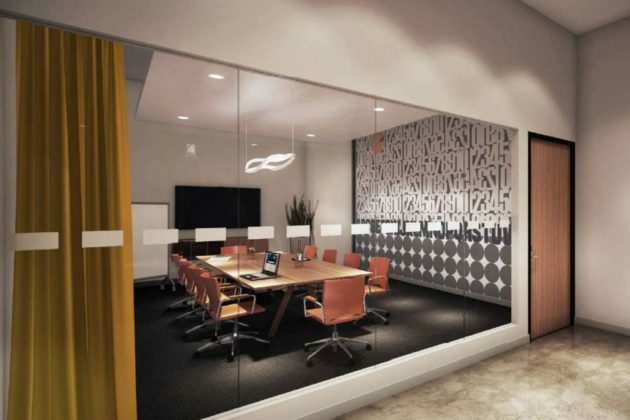 Coworking firm Spaces expects to open its new Artisphere location in November. 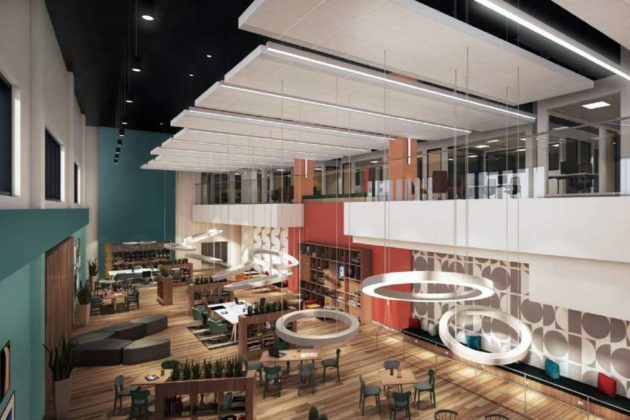 The location will feature 22,000 square feet of office space, an event space, an outdoor patio and a gym with showers, we’re told. 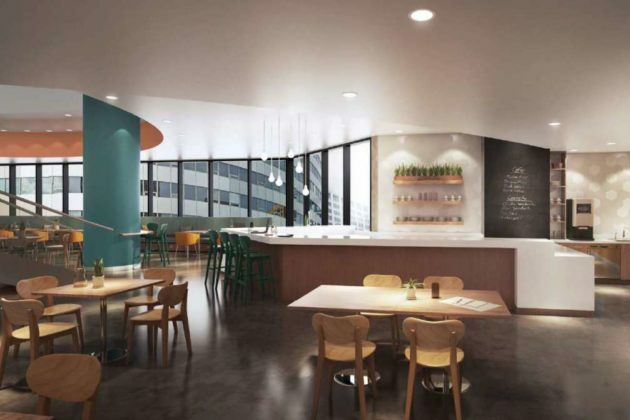 Renderings show sleekly-designed communal spaces designed for collaborative work. 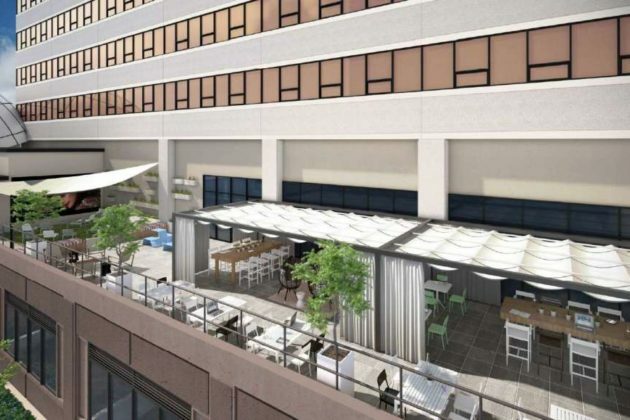 The former Artisphere cultural center in Rosslyn will get a new life as a 45,000 square foot co-working space, its owner announced today. 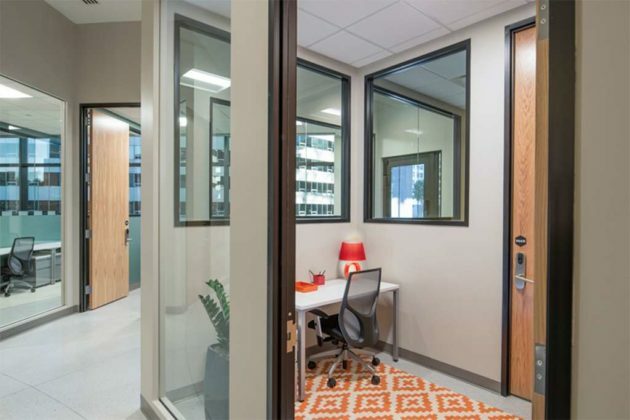 The building at 1101 Wilson Boulevard will host a “flexible workspace,” called “Spaces,” from office space provider Regus, according to a news release from real estate firm Monday Properties. 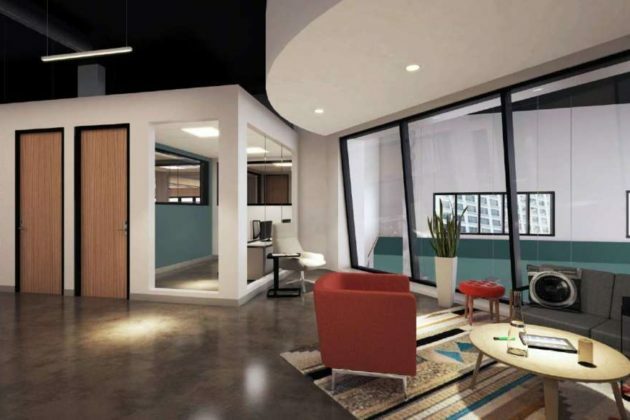 Geared toward tech businesses, the redeveloped property will have an open layout that is intended to encourage collaboration among workers. 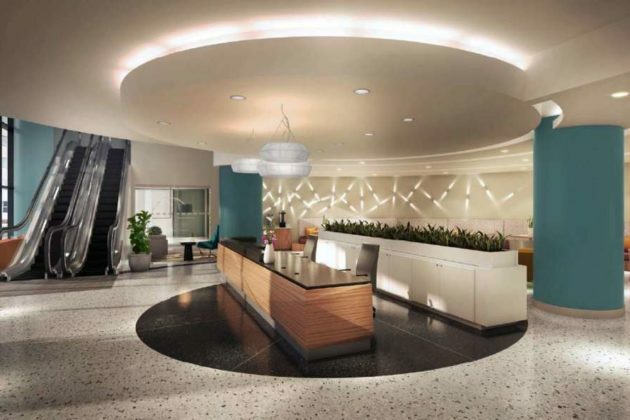 Regus and Monday Properties are working to transform the former Artisphere building over the next year. It wasn’t immediately clear when the co-working space will open. 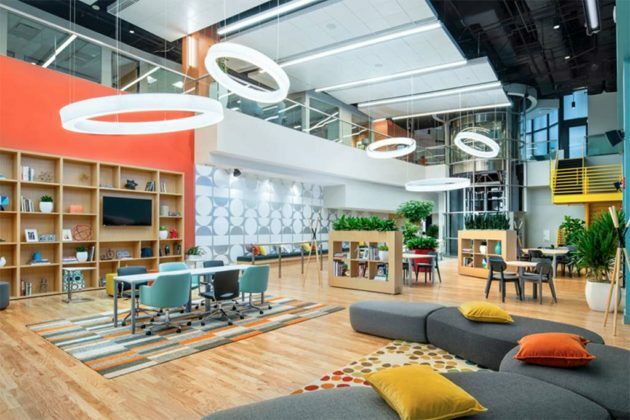 When the co-working space does open, it will compete with Arlington-based MakeOffices, which has a location in a Monday Properties building at 1400 Key Boulevard in Rosslyn. Arlington County terminated its lease on the Artisphere space last fall. Before the county used the building, it housed the Newseum. The full press release, after the jump. A mobile art and performance venue may be coming to Arlington. The Arlington County Board on Saturday is set to consider the purchase of an “arts truck.” In a staff report, officials said the truck could bring the arts to various locations across the country, partially filling the void left by the closure of the Artisphere in Rosslyn. Nearly $30,000 of the costs is being provided by donations that were made to Artisphere but never spent. 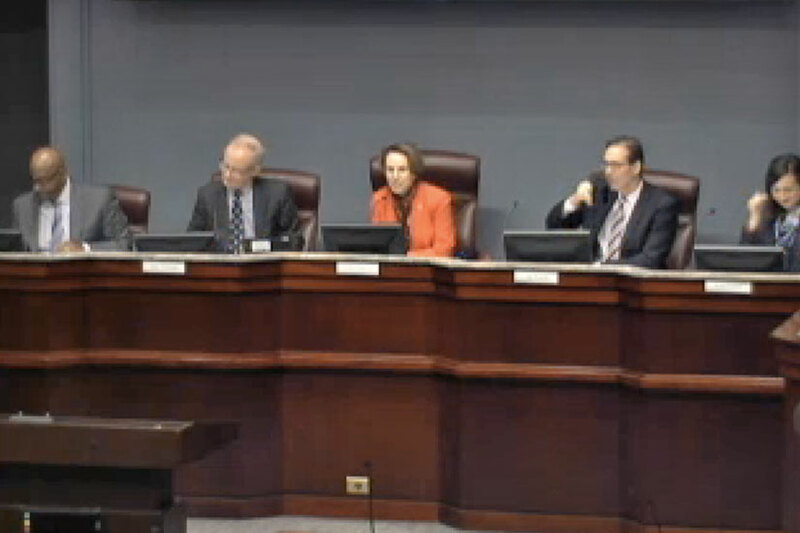 Close to $40,000 is being provided by existing Arlington County arts funds. (Updated at 12:40 p.m.) One of the most recognizable features of the former Artisphere cultural center in Rosslyn is not on the chopping block, after all. 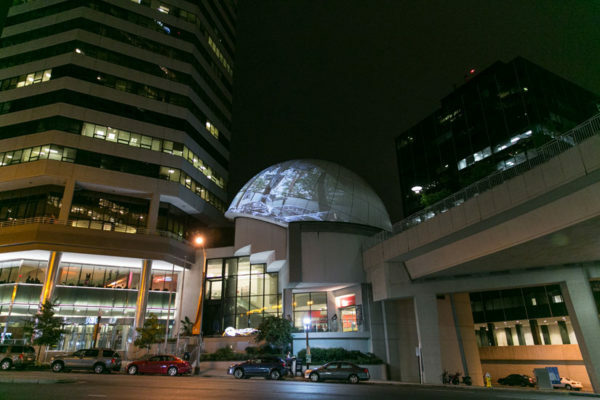 On its Nov. 14 meeting agenda, the Arlington County Board is scheduled to consider a site plan amendment for 1101 Wilson Blvd, “relating to the demolition” of the Artisphere dome. The county terminated its lease on the Artisphere space last month, five years after the center first opened. Previously used by the Newseum, when it was located in Rosslyn, the dome theater may narrow down the kind of tenants property owner Monday Properties can attract. SP# 89 1101 Wilson Owner, LLC to delete Condition #4 relating to demolition of dome structure on Wilson Boulevard; in C-O zoning district under ACZO §15.5. 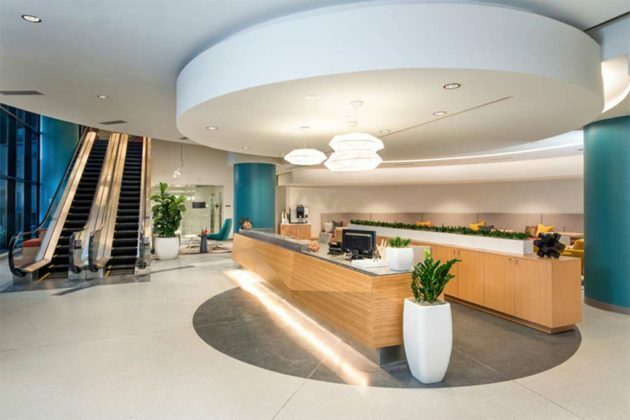 Property is approximately 60,700 sq. ft.; located at 1101 Wilson Blvd. 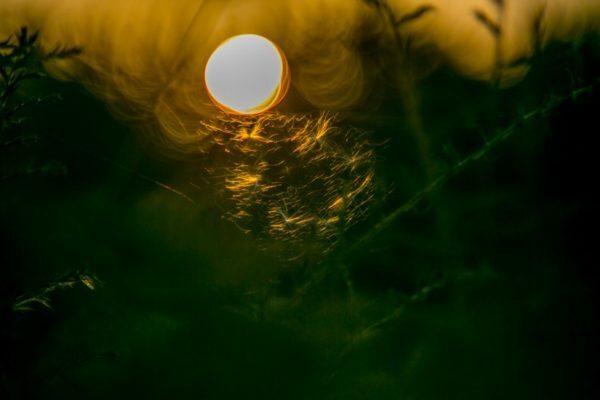 ; and is identified as RPC# 16-039-002; -003; -021. Applicable Policies: GLUP “High” Office-Apartment-Hotel; Rosslyn Sector Plan. However, county officials now say that the dome is not in danger, at least for now. This condition currently requires that the Newseum Dome be demolished if the County moves forward with construction of the Loop Road in Rosslyn (the Dome is located partially within what would have been the right of way for the Loop Road). Given adoption of the new Rosslyn Sector Plan this past summer, in which the Loop Road concept was abandoned, there is no longer a need to demolish the dome, and therefore the property owner wants the condition requiring demolition removed. As is my understanding, Monday Properties does not want to demolish the dome, but would like to market the space without the encumbrances required by Cond. #4. A little more than five years after Artisphere opened, the doors are shutting for good on what was once touted to be Arlington’s cultural crown jewel. 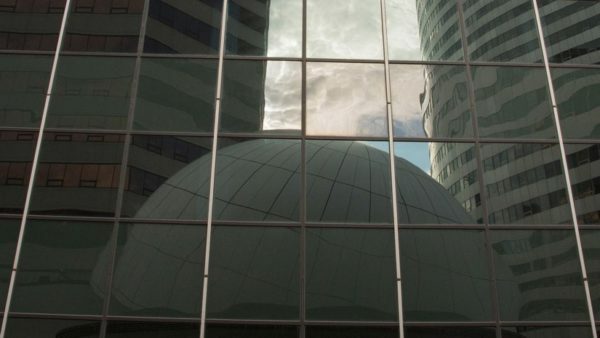 Without any discussion, the County Board unanimously voted to end the county’s lease for the Rosslyn space formerly occupied by Artisphere during its meeting last night. 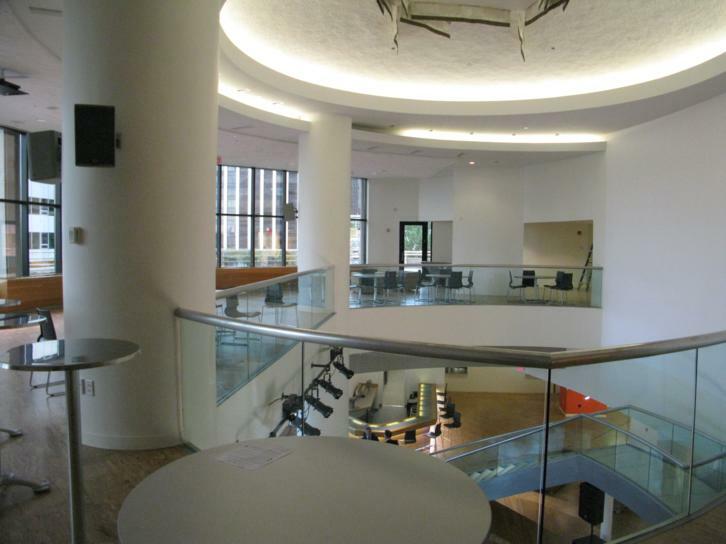 Artisphere, which opened on Oct. 10, 2010, shut is doors in June 2015, following financial problems. It will cost the county $447,436.24 in payments to break the lease, which will end on Oct, 31. The lease on the property was originally written with an expiration date in April 2023. Negotiations with landlord Monday Properties resulted in about $100,000 in savings on the lease termination, county staff said. Utilities and maintenance for the space cost the county nearly $1 million per year. At this time, the county has not calculated the final cost for closing the cultural center, county staff said. The Artisphere cultural center in Rosslyn closed in June, but on Saturday the County Board is expected to shut the door for good by terminating Artisphere’s lease. Arlington County leased the 62,000 square foot former Newseum space at 1101 Wilson Blvd in November 2008. 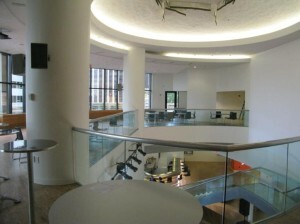 It opened Artisphere on Oct. 10, 2010. Intractable financial losses at Artisphere — contrary to rosy projections made prior to the center’s opening — combined with a lack of local community participation to doom it. An effort to have the Artisphere space used for a tech incubator and conference center apparently fell through, leading to the lease termination recommendation from county staff. Not helping matters: it costs about $1 million per year to maintain the space, including electricity, heating and air conditioning costs. Building owner Monday Properties, which gave the space to Arlington virtually rent free, will now be free to attempt to find a new tenant. Negotiations regarding the early lease termination have cut the county’s total costs by more than $100,000, staff said. The money will come from $1.3 million in funding already allocated by the County Board for the closing of Artisphere. The total cost of the facility’s shuttering is not yet available. “Other expenses associated with the closure of the facility are still processing and a final estimate of the total closure costs will not be available until all invoicing is complete and internal accounts are reconciled,” county staff wrote. The County Board will consider the lease termination at its meeting this coming Saturday. Arlington County Manager Barbara Donnellan and the staff of Artisphere are saying farewell. Today is Donnellan’s last day as the top executive in Arlington County government, before her retirement, which was announced in March. Deputy County Manager Mark Schwartz will serve as acting county manager while the county continues to conduct a nationwide search for Donnellan’s permanent replacement. Donnellan sent the following goodbye memo to county staff this afternoon, after spending much of the morning walking around county government headquarters and saying goodbye to staffers in person. Friends: I could not leave today without thanking you all for your hard work and your many contributions that have helped make Arlington a great community. How quickly thirty-one-and-a-half years have flown by. It has been an amazing ride. Together, we have accomplished so much. For me, the most satisfying aspect of this job has been the opportunity to come to work each day and interact with such a talented group of people. But all great things must come to an end. Tomorrow, I start a new chapter, and I’m looking forward to exploring new opportunities. 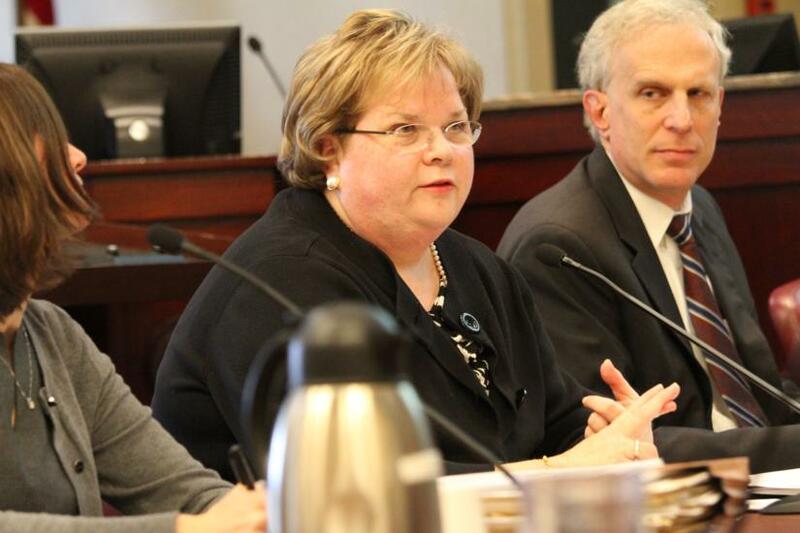 Under Mark Schwartz’s able leadership, I know that you will continue to do great things. Again, thank you for everything. It has been such a privilege. Also bidding adieu is Artisphere, which is set to permanently close its doors after today. The staff of the cultural center in Rosslyn sounded a proud, defiant note in a goodbye message sent to its email list this afternoon. That note is below, after the jump. Artisphere hosted its final performances this past weekend, as it prepares to close for good at the end of the month. Supporters decry the closure as the county government prioritizing penny pinching over the arts. 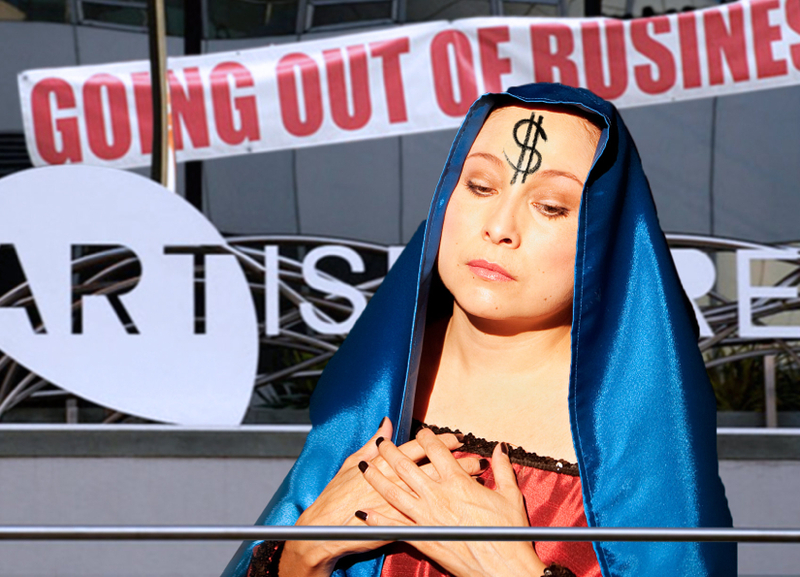 But Artisphere’s financial losses may have been secondary to another problem: lack of community engagement. The cultural center in Rosslyn spent more than $1 million on marketing over four and a half years, largely targeting D.C. area arts aficionados with newspaper ads. The strategy paid off with sold-out niche concerts and events, but failed to attract the loyalty of many Arlington residents who have a more casual appreciation for the arts. Instead of the original vision of a hub for local arts groups and a community hangout, complete with a WiFi cafe, Artisphere became more of a regional draw for one-off performances. Some 75 percent of its audience came from outside Arlington and 83 percent of its artists from outside Virginia, according to a 2014 report. 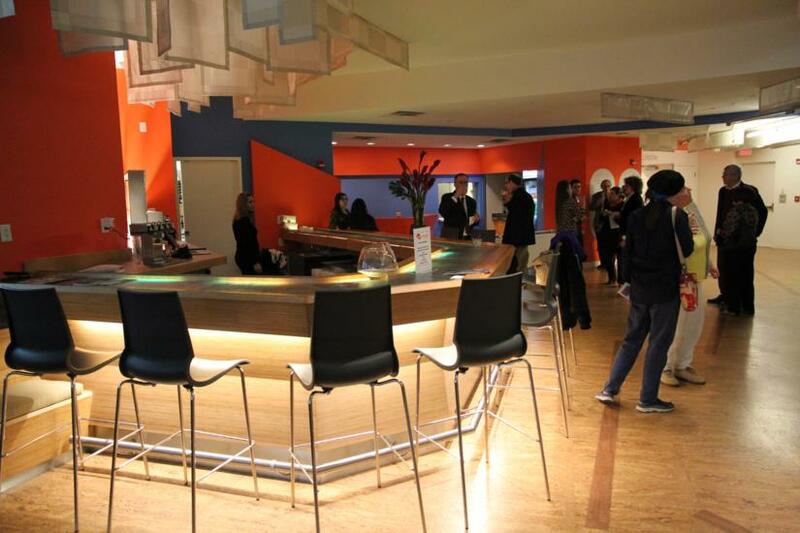 The cafe closed, Artisphere focused more on event rentals and a popular local theater company was booted out. It didn’t help that Artisphere’s multitude of performance venues were small and, as officials figured out after opening, couldn’t host simultaneous events due to noise bleed. 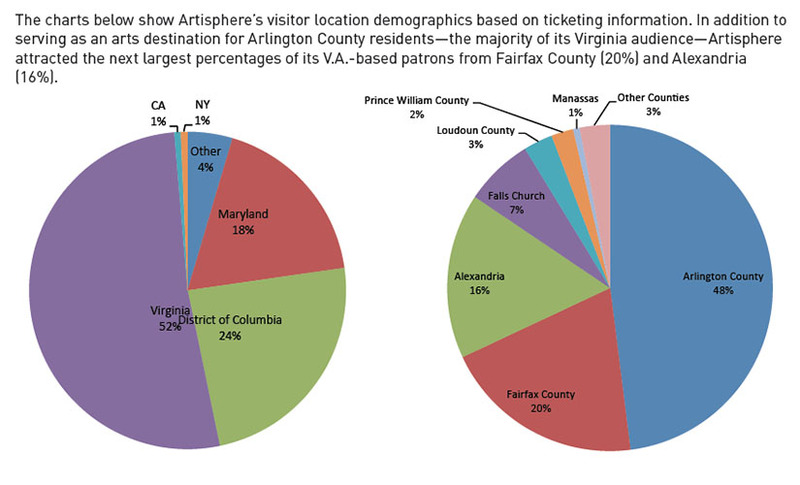 The relative lack of participation from taxpaying Arlington residents and artists, in the end, may have been Artisphere’s biggest downfall. When Artisphere hit the chopping block, few residents showed up at County Board meetings to speak in its defense. 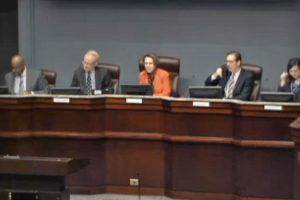 Donnellan and the County Board faced criticism in the local arts world for the decision, with letters to the editor, the chair of the Arlington Commission for the Arts and even a Washington City Paper cover story implying that the Board was naive in closing Artisphere just because it was losing money. “Artisphere’s closure is symptomatic of a much larger political view of culture in which the arts are important to community building, but funding them is not,” the City Paper wrote. 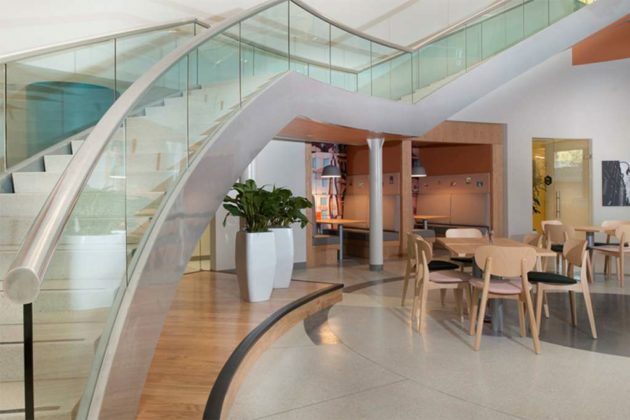 It along with the Washington Post were the beneficiaries of 55 percent of Artisphere’s marketing budget.